When Should They Be Heard? When should children be heard and how should that happen? Unlike other areas of law, in family law there is no “magic age” for when children have a right to have their wishes enforced, or even heard. Children are not entitled to advocacy representation.1 Rather, Wis. Stat. section 67.407 (4) requires the guardian ad litem to “consider, but not be bound by, the wishes of the minor child…” Further, the statute requires the GAL to “communicate to the court the wishes of the child” unless the child requests otherwise. A Feb. 4 program, “Understanding and Presenting a Child’s Voice in the Court System,” addresses a common question in family law: When and how are a child’s preferences to the court? We know that the GAL cannot be a witness.2 We presume the GAL will simply tell the court, not subject to cross-examination or hearsay objections, what the child has to say. Interestingly, in many other states, children are routinely brought to court to talk to the judge, frequently in chambers and sometimes with a GAL present. It is difficult to imagine a worse scenario. Courtrooms are intimidating enough for adults, let alone children. Of course, the right of confrontation does not exist, and frequently there is not even a court reporter present. Worse, it is questionable how well judges are trained, if at all, in speaking to children, especially children who may be traumatized by the divorce. Given the alternatives, Wisconsin’s system, rules of evidence be damned, seems pretty sensible. In real life, the issue is largely age dependent. Although the statute does not distinguish by age, for children under about 10 years old, they should not have any choice in the matter. Children over 16, especially if they have a car, are the 600-pound gorilla. Where does a 600-pound gorilla sit? Wherever it wants to. The difficult cases are the children in their early to mid-teens. There are two schools of thought: Some prefer a child empowerment model, where these children have a right to be heard. Others prefer a paternal model, where children are given little or no choice, much as they have to attend school, like it or not. My preference is somewhere in between the two extremes. 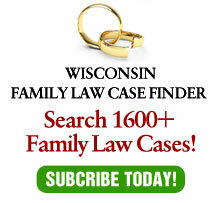 Each case should be fact dependent, the important facts include the age of the child (for example, age 11 versus age 15 makes a big difference), the maturity of the child, any evidence of parental alienation, any evidence of domestic violence or substance abuse, and the reasons stated by the child. These issues are critically important, as telling a child of a certain age and maturity that they have no right to be heard can be dispiriting. On the other hand, empowering children at too early an age does them no good, either. Most important, children need to be told that they don’t need to make this choice at all. For all of these factors, and other factors as well, we need train GALs not only on the substantive law, but on how to talk to children who are caught in the middle of these battles. 1 Joshua K. v. Nancy K, 201 Wis. 2d 655, 549 N.W.2d 494 (Ct. App. 1996). 2 Hollister v. Hollister, 173 Wis.2d 413, 496 N.W.2d 642 (Ct. App. 1992).